At the moment, I'm currently scribbling out ideas of what I want IADW to feature next year. Ideas are highlighted, ideas are crossed out, all with juice and cookies heavily on hand. One artist also reshaping his online presence for the New Year is Adi Granov. The Marvel mainstay is getting ready to bring his unique style to a revamped adigranov.net and if it's anything like it's Tumblr predesscessor, it's going to be a great resource of not only finished work, but behind the scenes snapshots as well. In other words, artistic gold, even if his name says otherwise - isn't that right Mr Radd? Now i know Mike Allred has already been cast as artist for next year's Silver Surfer series, but if he ever gets RSI for thirty odd days, this piece has to staple in Adi as a serious alternative. 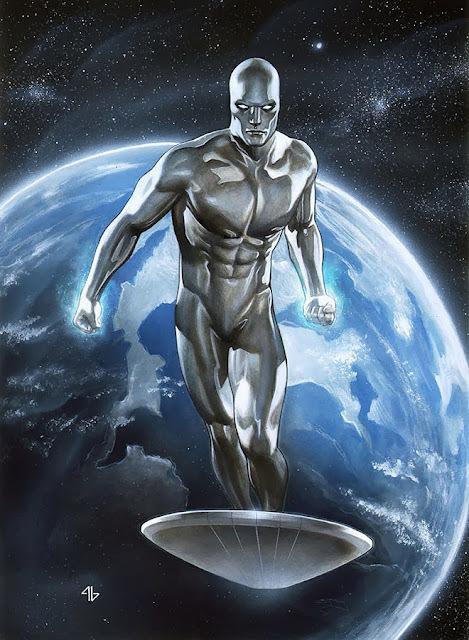 It's the true sign of a distinctive pro, that they can take a common sight such as the Surfer standing in front of earth, make it seem freshly their own, and not just a homage to the likes of John Buscema. As you can see, Adi doesn't do all the heavy lifting in the digital arena. 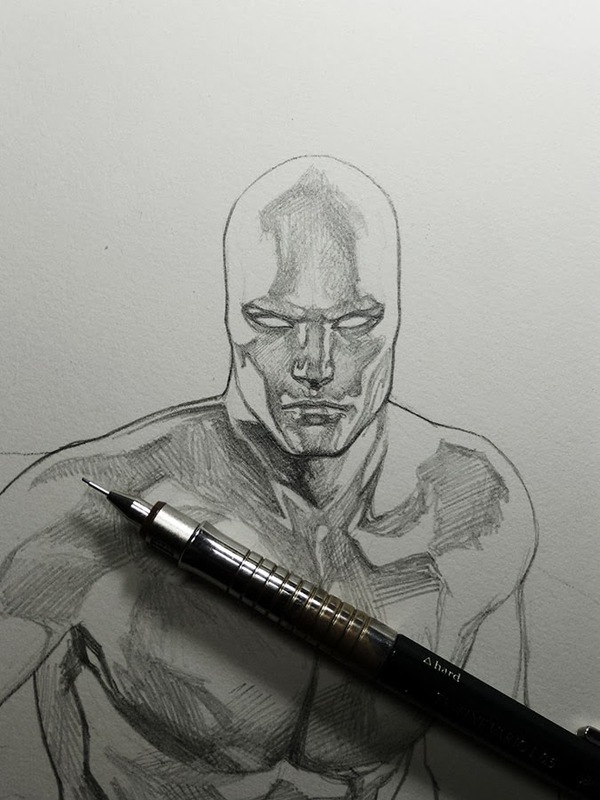 His pencils are so tight, the face and tonal work are finished before colour even hits the art - if anything the digital work only enhances the strong line work beneath! What do you think? Keep an eye on adigranov.net for more cosmic Adi art! OH I hear you Dan! I know Adi's not the quickest of artists when it comes to put out monthlies, but I definitely second that request that he be put on the book. Hell, he can just do covers. That'll suffice right? If he drew covers here Dale it would be the best thing since Hughes did Wonder Woman. That's a 'flash fact'. Was just reading Silver surfer last night, the Annihilation spin-off from 2006. Could this Adi [never heard of him till now] be the new Surfer artist on his new series? Re Adam Hughes's WW...a pity his WW Year One has been officially cancelled - but then he never got round to it, having promoted it for six years now[!]. Loved his style of WW but what I didn't rate were her baggy boots he drew on her. It would be awesome if he was Karl. Adi drew the interiors to Warren Ellis's relaunch of Iron Man, as well as providing covers. Thats when I first saw his art. Now I have an album of his work on pinterest and escape into it often be the subject Hawkeye or War Machine. I really dug Diana's boots! I even tried to copy drawing that style - and how he drew hair - but you'd still buy a few copies if I drew Wonder Woman wouldn't you?